On the 20th of May the top notch Chilean Horse breeding farm Aguas de los Campos y Maquena had a celebration for over 300 people in which they wanted to show make their appreciation for the Claudio and Rufino Hernandez. This year the Hernandez brothers were the official riders for the farm for the first time and they not only brought home the national championship at Rancagua on the horses Malulo and Estruendo but they also achieved this with a new national record of 48 points. The owner of the farm Italo Zunino and all his family expressed their appreciation not only for the riders but also the trainers, ranch crew and veterinary staff that all contributed to the team effort. On May 17th, 2006 the BOD of the ANCR (National Association for Reining Horses) met and determined the particulars concerning the second FEI sanctioned Reining competition in Chile. The president Therese Matthews was joined by the secretary of said organization Teresita Guzman. Also present was the treasurer of the Reining Commission of the Chilean Ecuestrian Federation Edmundo Hermosilla, Dr. José Luis Pinochet, Robert Hans Smeelen, Miguel Acuña, Rodrigo Gras, Pablo MacKena, Pablo Márquez and Rosario Poblete. In this meeting it was informed that the Federation of Chilean Horse Breeders intends to build a special arena for reining in Parque Hurtado where they plan to inaugurate this event in a big way for the Chilean Heritage Week during the Independence Day holidays. It was also expressed that the Federation of Chilean Horse Breeders has designated 2006 the Promote Reining Year in Chile. 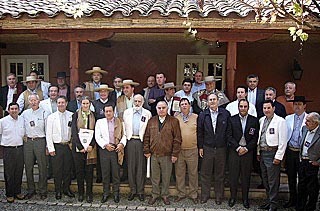 On the 5th and 6th of May, 2006 the Council of Directors of the Chilean Horse Breeders Association met in The Hotel El Parque in the town of Villarica located in the IX Region of Chile. In the formal meeting of the directors representing the 27 Chilean Horse Breeder Associations in Chile many topics were discussed. However, the prominent news coming out of the meeting was: 1) the agreement to phase out the Chilean Horse Trials in a transition towards incorporating the disciplines of International Reining (one of the 7 disciplines approved by the World Equestrian Games) and the Golden Bit Competition (a multiple discipline event actively practiced by the four other member countries in the Interamerican Federation of Criollo Horse Breeders). 2) the creation of an International Registry for the Chilean Horse that is bred abroad. Many other topics of internal concern were discussed as well and aside from sharing meals and friendships those attending were invited to tour the facilities of the breeding farms Criadero Santo Tomas and Criadero las Peñas that are located in the viscinity.